Pneumonia is an inflammatory condition of the lung—especially affecting the microscopic air sacs (alveoli)—associated with fever, chest symptoms, and a lack of air space (consolidation) on a chest X-ray. 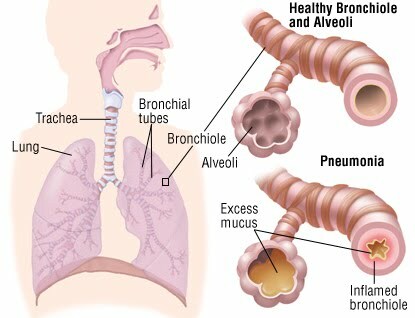 Pneumonia is typically caused by an infection but there are a number of other causes. Infectious agents include: bacteria, viruses, fungi, and parasites. Pneumonia is due primarily to infections, with less common causes including irritants and the unknown. Although more than one hundred strains of microorganisms can cause pneumonia, only a few are responsible for most cases. The most common types of infectious agents are viruses and bacteria, with its being less commonly due to fungi or parasites. Mixed infections with both viruses and bacteria may occur in up to 45% of infections in children and 15% of infections in adults. A causative agent is not isolated in approximately half of cases despite careful testing. The term pneumonia is sometimes more broadly applied to inflammation of the lung (for example caused by autoimmune disease, chemical burns or drug reactions), however this is more accurately referred to as pneumonitis. Impaired Gas Exchange a nursing diagnosis approved by the North American Nursing Diagnosis Association, defined as excess or deficit in oxygenation and/or carbon dioxide elimination at the alveolocapillary membrane. Etiological and contributing factors include an altered oxygen supply, changes in the alveolar-capillary membrane, altered blood flow, and altered oxygen-carrying capacity of the blood. Defining characteristics include changes in mental status such as confusion, somnolence, restlessness, and irritability; ineffective coughing and inability to move secretions from the air passages; hypercapnia; and hypoxia. Nursing Diagnosis for Pneumonia : Impaired Gas Exchange related to changes in the alveolar-capillary membrane (inflammatory effect), the oxygen-carrying capacity of blood disorders (fever, displacement curves of oxyhemoglobin), impaired oxygen delivery (hypoventilation). Goal: Demonstrate improved ventilation and oxygenation of tissues with blood gas analysis within the normal range and no symptoms of respiratory distress. Expected outcomes: Participate in actions to maximize oxygenation. Assess the frequency / depth and ease breathing. Give oxygen properly as indicated.